A Labradoodle is a crossbred (hybrid) dog crossing the Labrador Retriever and a Standard or Miniature Poodle. The beauty of this breed is the combination of the low-shedding coat of the Poodle with the gentleness and trainability of the Labrador. Labradoodles are friendly and good with families and children. Like their parent breeds, both of which are amongst the world’s most intelligent dog breeds, Labradoodles are very intelligent and quite trainable, often seeking commands and finding pleasure in learning. An Australian Labradoodle is a crossbred (hybrid) dog crossing the Labrador Retriever, Poodle, and a type of Spaniel. The beauty of this breed is the combination of the low-shedding coat of the Poodle with the gentleness and trainability of the Labrador, plus the sweetness of the Spaniel. Australian Labradoodles are friendly and good with families and children of all ages. Like their parent breeds, they are amongst the world’s most intelligent dog breeds, Australian Labradoodles are very intelligent and quite trainable, often seeking commands and finding pleasure in learning. Like the texture of lamb’s wool, the coat is soft, not harsh or coarse, and curly to loose waves. This coat is reliably non shedding. This is a low to no odor coat. This coat is common in the early generations and is a straight, shaggy and shedding coat. This coat has the typical doggy odor. The Australian Labradoodle in a number of different and beautiful colours. We have had Red, Chocolate, Lavender, Black, Parchment, Caramel and Apricot. 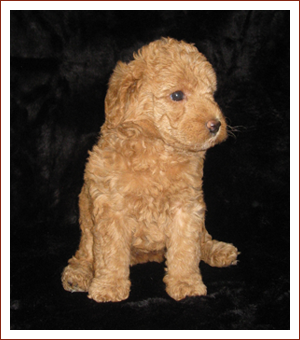 Our specialty at Ashford Manor Labradoodles is the apricot and rare red colors of Australian Labradoodles. For a Complete listing of Australian Labradoodle Colors, visit the ALAA. Weight: 30 – 45 pounds at maturity. Weight: 50 – 65 pounds at maturity. The Australian Labradoodle has a delightful and friendly character. They are non-aggressive dogs with a gentle temperament, as well as designer dogs with a captivating personality. Because of their keen intelligence, they are very eager and easy to train even when they are puppies. They are joyful, energetic and playful when free; yet soft, quiet and loving when handled. The Australian Labradoodle is athletic and graceful even while remaining compact in stature. Because of their cleverness they are fantastic with children, as therapy dogs and for people with special needs. They are affectionate, sociable dogs who, when properly trained ~ rarely bark. This breed was originally bred for therapy and service work to keep this up we are working with a top trainer to provide therapy and service dog training to our clients. To find out more, Click Here. This is a good grooming video of the Australian Labradoodle.